Phoenix II barcode readers for connection to mac or pc, usb. "The Phoenix Holder Makes Life Easy."  Pass your codes under an "Always-On" barcode reader.  Keep you Phoenix II barcode reader away from desk clutter.  Reduce risk of knocking, and damaging, your barcode reader. 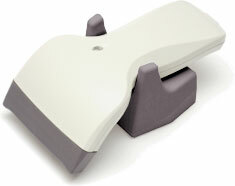  Sturdy, weighted, plastic base. 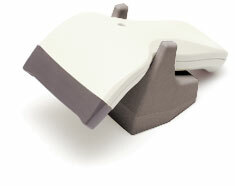  Dual positions for Holder or Hands Free Reading.  Adheres to computer if required to free desk space. 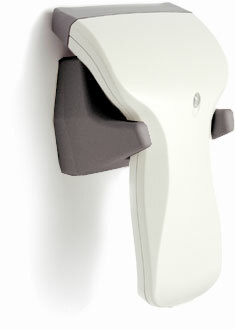  Can be wall mounted - ideal for warehouse and perso nnel tracking. The Phoenix II barcode reader holder keeps your barcode reader ready to scan at all times.  Set the Phoenix II barcode reader to "Always-On" mode and simply pass the codes under it as and when you need to.  Unscrew and reverse the base to place your barcode reader in a "Nose-Down" position if you simply want to store it between scans.  Screw to the wall to save even more space and allow the Phoenix II barcode reader to be used in doorways and on the shop floor. Great for tracking items, paperwork or people in and out of rooms or buildings.